Think that your email newsletter is too small to be worthy of your time and attention? Wonder if you can outsource your content especially your newsletter to the intern? When a Dutch reader asked why she had only written 4 blog posts in 2017, Handley decided to rethink her personal brand’s email strategy. At the time, she had 3k subscribers on her personal newsletter list. Unlike you, Handley has heaps of time to hole up in her little house and turn out tons of quality content for her readers. That is if you don’t count managing MarketingProfs’s content with its stellar MarketingProfs B2B Forum while being the globe trottingest female marketing speaker. Despite this, Handley assessed what she could dependably deliver to her readers and decided to write and send an email newsletter every other Sunday. In her Content Marketing World keynote, Handley pointed out that the key to a successful email newsletter is the LETTER portion. For those of you who may be too young to remember, a letter refers to an older form of communication where you paid for its delivery by a mailman with a postage stamp. Therefore, the secret to successful newsletters doesn’t depend on your marketing! Rather, your audience controls your newsletter success! Yes, this means the real people you call recipients decide if your missive is relevant to them. I dubbed these regular doses of handcrafted information consistent content. Let’s examine why consistent content and share of audience attention are crucial to content marketing, particularly as they relate to content distribution. Do you regularly send newsletters or other form of content to your addressable audience? 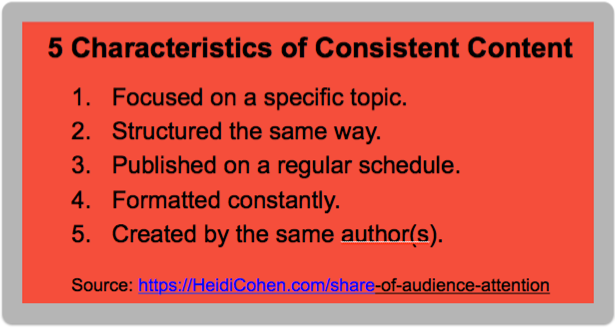 Also referred to as cyclical or recurring content, consistent content is information that you publish weekly or every other week that resonates with your readers. Focused on a specific topic. Uses a pre-established content hook that doesn’t change over time. Structured the same way. Has a reliable architecture for authors and readers. This uniform approach makes the information easy-to-create and consume. Because they’re moderate length pieces, readers can quickly scan the content to decide on reading it or not. Published on a regular schedule. As a result, provides predictability (in a good way!) Readers know who, what, when, where and how content will be published. Over time, this builds up your share of audience attention. It’s the digital version of appointment media. Formatted consistently. Uses the same media format (audio, video, or webinar) each time. As a result, you know your audience likes this content. Created by the same author(s). Provides a reliable voice. Further, it builds an expectation for both the writer and the reader. Consistent content remains core to marketing since it encourages your audience to develop a content consumption habit related to your information. You may think that consistent content is about you, your content marketing resources, and your addressable house file. “I talk a lot about the need to put your reader first. To serve an audience. To make something that you love in service to those who will miss you if you don’t show up on time. If not, you’ve got a serious marketing problem. Because beyond getting your on-going information consumed, your audience won’t pay attention to your larger content efforts. More importantly, with consistent content, you can become part of your audience’s inner content circle. This velvet rope content group consists of the information sources that your target audience actively seeks. As a result, regardless of your business, you’re competing with highbrow names like The Economist and The New Yorker as well as their favorite sports teams and stores. When you deliver consistent content over time, your recipients proactively seek, consume and act on it. As a result, you build Share of Audience Attention or SOAA. This explains why Joe Pulizzi single-mindedly focused on email registrations as his main indicator when he started Content Marketing Institute. Further and more importantly by keeping your promise to your audience you earn their trust over time. Start by putting this information into context. Handley only had 3,000 subscribers when she started and she’s been creating consistent content since she was an entry-level journalist at The Boston Globe. So you can do this, even if you have less than a 1,000 people on your list! According to Entrepreneurial You author Dorie Clark, she was invisible for 3 to 5 years while she created content to expand her network. She wrote 250+ articles, interviews and profiles before doubling down on her email list growth. Before worrying about resources, let’s examine these 3 easy-to-follow tips that will help you to build Share of Audience Attention regardless of your current audience size. Commit to consistently produce and distribute content for your audience. Like Handley, show up when you promised to. Otherwise, you’ll loose your existing audience. 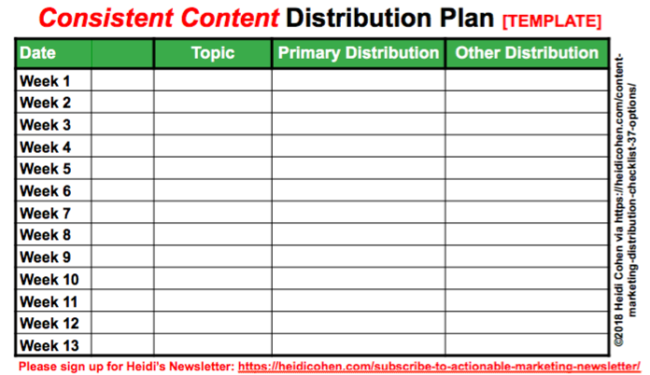 Here’s a chart to help you plan your content so it’s aligned with your mega-content. Show your personality. Whether you’re a major brand or a solopreneur, your content needs a voice. It must be recognizable and sound like only you could have written it. As Handley pointed out, Warren Buffet writes his famous shareholder letters so that his sister Doris can understand it. (Translation: Plain everyday, non-financial language.) Before you start creating consistent content, answer who is the one person you plan to write for. I get it! I was afraid to do this for a long time. BTW, I’d be thrilled if you subscribe to my newsletter! Build your audience over time. 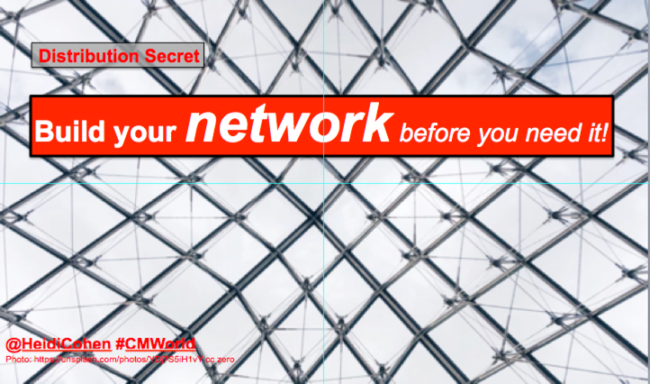 As Clark revealed, networking helps build your reach. In my Content Marketing World presentation, I made this point because it’s critical to pay-it-forward to help colleagues and subscribers by being willing to engage and respond to their concerns. 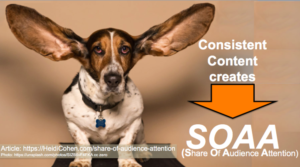 Share of Audience Attention or SOAA applies to creating a desire and expectation for your content in each member of your audience. You build SOAA by delivering quality consistent content. Following Mc Phillips’s reasoning, this makes developing SOAA key to your content marketing since it deepens your relationship with your audience and supports content distribution. As a result, your readers actively seek, consume and act on your mega-content and crowd pleaser content because you’ve created audience anticipation for your content. Tags Andrew Davis, Ann Handley, Cathy McPhillips, consistent content, content inner circle, Joe Pulizzi, share of audience attention. Bookmark the permalink.